Hypertension. For the first line treatment of mild to moderate essential hypertension and can be used as the sole agent to control blood pressure in the majority of patients. Patients not adequately controlled on a single antihypertensive agent may benefit from the addition of amlodopine which has been used in combination with a thiazide diuretic, beta adrenoceptor blocking agent, or an angiotensin-converting enzyme inhibitor. Angina. For the first line treatment of chronic stable angina. It may be used alone, as monotherapy, or in combination with other anti-anginal drugs. INDICATIONS AS AT 15 May 2003: 1. Hypertension. NORVASC is indicated for the first line treatment of hypertension and can be used as the sole agent to control blood pressure in the majority of patients. Patients not adequately controlled on a single antihypertensive agent may benefit from the addition of NORVASC, which has been used in combination with a thiazide diuretic, beta adrenoceptor blocking agent or an angiotensin-converting enzyme inhibitor. 2. Angina. NORVASC is indicated for the first line treatment of chronic stable angina. NORVASC may be used alone, as monotherapy or in combination with other antianginal drugs. Shelf lifetime is 5 Years. White to off-white, emerald-shaped tablets engraved "AML5" and breaker score on one side and "Pfizer" logo on the other side. This medicine was verified as being available on the PBS (Pharmaceutical Benefits Scheme) on April 1, 2019. To learn more about this subsidy, visit the Pharmaceutical Benefits Scheme (PBS) website. 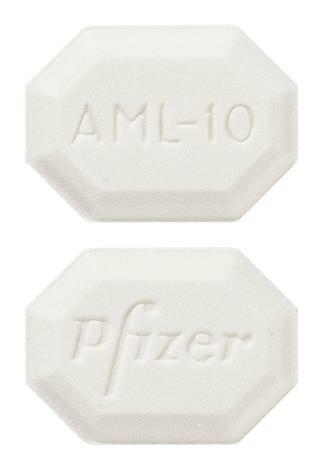 White to off-white, emerald-shaped tablets engraved "AML10" on one side and "Pfizer" logo on the other side. Angina can affect people in different ways and the symptoms may vary at different times. It usually lasts only a few minutes and can be relieved by rest and/or medicines.